A platform providing insights and benchmarking to SMEs by integrating data from their business software apps into a single smart dashboard. 9 Spokes is a global platform which aims to help banks to power their SME ecosystem and drive engagement, loyalty and revenue growth within their business base. 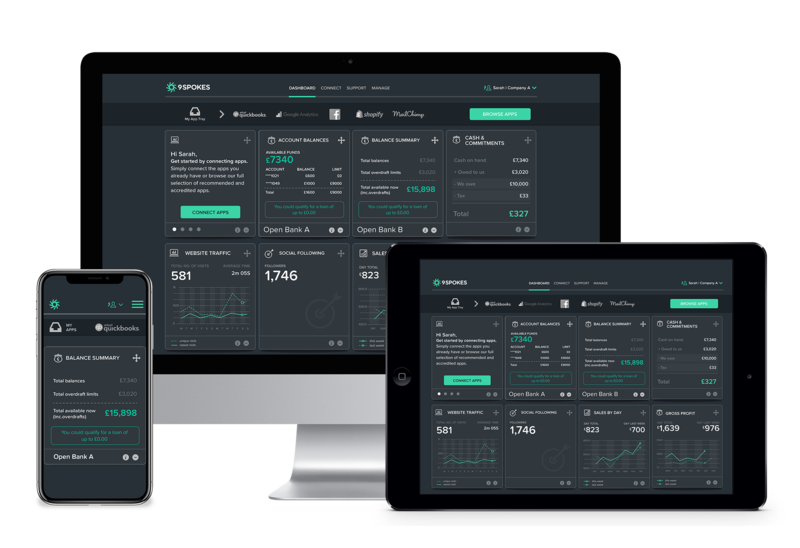 The platform provides SME users with rich insights into their business, from cash flow and sales through to digital marketing performance, by integrating data from their business software apps into a single smart dashboard using widgets. 9 Spokes offers open banking widgets which utilise APIs to provide users visibility of their bank account directly from their dashboard. The platform can be provided on a ‘white label’ basis allowing a bank to go to market under its own brand.